Tyre regulations have changed a lot in Formula One history in order to limit cornering and acceleration speeds of the cars. As it is vital to the car's performances under cornering, the FIA have often tried to change dimensions, introduce grooves but have eventually decided to only allow one single tyre manufacturer in Formula One. The change fits in the cost cutting idea which the FIA is pursuing, while the excessive development rate of tyres can be efficiently slowed down. Since 2011, Pirelli is F1's sole tyre supplier after it was chosen by the FIA following a tender. Before that, Bridgestone was already a sole supplier since 2007, Bridgestone after Michelin left because it found the regulations not to suit the sport's and company's values. For every racing car, the tyres are the only direct contact patch between the track and the car. 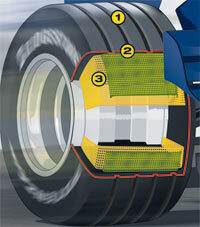 The performance of such racing tyres are therefore highly important and are all centred around increasing grip. On the tyre side, how a tyre derives its grip, or its friction with the circuit, can be characterised in two main ways; adhesion and hysteresis loss by deformation. Adhesion is where the tyre compound forms a chemical bond with either the circuit surface, or rubber that has already been laid down on the circuit surface. It's the stickiness of the tyre. Deformation is where the tyre, or more particularly the tyre compound, can move to fit around the irregularities of the track surface. Energy loss occurs here and friction results. This also helps adhesion too, as the more a tyre compound is able to deform around the track surface irregularities, the greater the contact area for adhesion to occur. In developing its tyre compounds Bridgestone looks at adhesion by concentrating on the chemical makeup of the rubber. Changes in the polymers than makeup the rubber mean that the compound reacts differently to the track surface. Processing the data for compounds and track surface interaction consumes a lot of resource at Bridgestone's technical centres. How soft the tyre compound is influences deformation, but the nature of the deformation is an important factor in the tyre design too. How quickly the tyre in its entirety deforms and regains its shape is related to tyre pressure, tyre construction and rubber compound. The compound on its own is the primary consideration in the deformation around the track surface irregularities. A racing tyre compound is therefore designed to deform quite quickly and regain its shape quite slowly, helping to maintain grip. From the 220 different materials used in a tyre, more than 100 are mixed to create an optimal compound. The compound (image, 1) is based on three main elements: carbon, oil and sulphur. More or less soft depending on the characteristics of each circuit, this sector changes considerably from one race to the next, whereas the structure evolves little by little throughout the season. To keep the tyre together there are bracing plies embedded in the rubber (image, 2). The carcass (image, 3) is composed of a Nylon and polyester framework, in a complex weave. This is the skeleton of the tyre. It provides rigidity against high aerodynamic load (more than one tonne of force at 250 km/h), strong longitudinal forces (4 G), lateral forces (5 G), and violent crossing of the vibrating strips. The grooved tyres as they exist between 1998 and 2008 posed an extra problem to the tyre structure. Changes in direction are harder with the grooves, as the rubber in contact with the track between the grooves has a tendency to become deformed. Another headache. The dimensions of the dry surface tyre are dictated above all by the maximum dimensions stipulated by regulations. However, tyres are sometimes designed to be smaller than the maximum limit for aerodynamic reasons. One must take into account that a few extra millimeters added to the width of a tyre can gain or lose several tenths of a second a lap, especially on circuits where high top speeds are achieved. 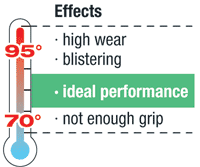 A dry-weather racing tyre in Formula One generally operates at an optimal temperature of around 100° C. In contrast, intermediate spec tyres are operate at between 40°C to 100°C, depending on the wetness of the track, while full wets approximate 30°C to 50°C. All heat that is created due to the tyre's friction with the surface should, in theory, be ideally distributed between the outside, the centre and the inside of the tyre tread (a bad distribution is often adapted to by changing camber). This temperature should also be identical from left to right, and from the front to the rear of the car. Too much heat at the front tyres will cause understeer while non-optimal temperatures in the rear tyres will result in oversteering. Measuring the tyre pressure as often as possible is also a priority. Although low pressure (of about 1.1 kg/cm2) allows the envelope to grip the track better and provides a greater contact area, a variation of just 0.2 kg/cm2 can "ruin" the performance of the car. Therefore, any tyre supplier gives a range in which the teams can pressurise their tyres, and it is then up for the team's engineers and tyre specialists to see at what pressure they run them. In order to ensure the lowest possible variations in tyre pressure (heat increases the pressure), F1 tyres are filled with a special mixture of gasses. "Moisture in the air makes setting tyre pressures very difficult," explains Tetsuro Kobayashi, Bridgestone Motorsport Technical Manager. "If you set the pressure in the pits with a cold tyre, or even one that's been warmed by a tyre blanket, the pressure will be different when the tyre has been brought right up to full operating temperature. This happens even when we use dried air, but this happens in a more progressive and predictable manner than when there is moisture present. If there was moisture present then there would be different amounts in different tyres depending on when and how they were filled so it would be impossible to predict the pressure change and it would be difficult to engineer the tyres to deliver their maximum performance"
Whilst Bridgestone uses dried air by default, there are other gases available and teams will often try or make use of these in their pursuit for an advantage. In various series, not only in Formula One, nitrogen, carbon dioxide and other mixtures have been used. The most important consideration for whatever gas is used is stability or a predictable change in density relative to temperature change to enable the optimum tyre pressure to be both attained and maintained. A second factor can also be the reactivity of the gas with rubber, a point where oxygen scores badly. At high temperatures, the oxygen molecules in air can react with the rubber and hence reduce the tyre pressure. It is sometimes also believed that the mass of the gas is taken into account as being important, but the truth is that the differences are marginal compared to the other factors. Recently however, the FIA moved to limit the allowed gases to air, nitrogen and carbon dioxide. In order to allow the tyre to be filled completely with the specific gas, each rim has two valves, one to let air out, while the other is used to pump it up. 1977: Michelin introduces radial tyres at the same time that Renault enters Formula One with the Renault RS01. A year later, Ferrari would also race with the Michelin radials after unoficially having a testing agreement with the tyre supplier since 1969. 1978: The first win on radial slicks is a fact when Carlos Reutemann wins the Brazilian GP, the second race of the season. He did so in a Ferrari 312T2. 1979: Jody Schekter becomes the first driver to be World Champion on radial tyres, in a Ferrari 312T4, the first Ferrari in Formula One with ground effect. Early on in the 1980's, tyre suppliers gradually switched from bias ply to radial tyres because of the performance benefits. Generally speaking, radial tyres allow for better and constant contact patch but operate at smaller slip angles and are therefore harder to drive at the limit. As a result, today's manufacturers produce their F1 tyres so that they lean somewhat to the design of bias ply tyres, attempting to benefit from the best of both worlds. Good comparisons of the different tyre designs can be found at michelin and rs-racing. 1983: Goodyear introduces its radial rain tire for Formula One cars at the Monaco Grand Prix. The racing radial features the unidirectional "gatorback" style tread pattern to improve wet traction. 1984: Goodyear introduces its radial slick tires to Formula One. 1985: First use of a tyre heating blanket. Pre-heater systems for the tyres are very beneficial in the first laps out of the pit, as without heating, a Formula One tyre would require up to 2 laps to get up to temperature. Until that time, the car behaves slippery and loses considerable time to cars with warm tyres. ... - 1998: No rules were existent concerning grooves in tyres, which allowed slicks to be used. 1998: F1 cars come on the track again with grooved tyres, even in dry weather conditions, after an abscence since 1971, when the slicks was introduced in Formula One. The rear tyres have 4 grooves, while front tyres have to be foreseen with 3 longitudinal grooves. 1999 - ... : Both front and rear tyres must have 4 longitudinal grooves. This regulation change also meant a (periodical) departure of Goodyear out of Formula one, as they were not prepared to make such investments. The introduction of the grooved tyres caused a lot of protest of multiple drivers, including 1996 world champion Damon Hill, and 1997 world champion Jacques Villeneuve, stating that the cars are more difficult to stop and are more prone to spinning hence not generating more safety, but actually raise the possibility of severe crashes. His outings later on forced him to excuse himself with the FIA for his "inappropriate behaviour". 2007: Contrary to previous years, all cars are required to race both available tyre compounds sometime during the race. To mark the difference, Bridgestone came up with an idea to paint one of the grooves white when it consists of a soft compound (the softer one of two dry weather tyre compounds available) or the full wets (compared to no marking on the intermediate tyres). During its attempt to cut cost and especially to improve overtaking, the FIA have been looking on ways how to reduce aerodynamic dependency and increase mechanical grip. After several tests during 2008, the FIA decided to re-allow slick tyres as of 2009 after 10 years of grooved tyres. One year earlier, GP2 also made the same move, stressing that motorsport should go back in time to improve competition. 12.6.1 All dry-weather tyres must incorporate circumferential grooves square to the wheel axis and around the entyre circumference of the contact surface of each tyre. - 50mm (+/- 1.0mm) between centres. Furthermore, the tread width of the front tyres must not exceed 270mm. The measurements referred to in b) and c) above will be taken when the tyre is fitted to a wheel and inflated to 1.4 bar. 12.6.4 A wet-weather tyre is one which has been designed for use on a wet or damp track. All wet-weather tyres must, when new, have a contact area which does not exceed 280cm&sup2; when fitted to the front of the car and 440cm&sup2; when fitted to the rear. Contact areas will be measured over any square section of the tyre which is normal to and symmetrical about the tyre centre line and which measures 200mm x 200mm when fitted to the front of the car and 250mm x 250mm when fitted to the rear. For the purposes of establishing conformity, void areas which are less than 2.5mm in depth will be deemed to be contact areas. 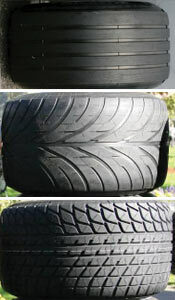 12.6.5 An extreme-weather tyre is one which has been designed for use on a wet track. All extreme-weather tyres must, when new, have a contact area which does not exceed 240cm² when fitted to the front of the car and 375cm² when fitted to the rear. Contact areas will be measured over any square section of the tyre which is normal to and symmetrical about the tyre centre line and which measures 200mm x 200mm when fitted to the front of the car and 250mm x 250mm when fitted to the rear. For the purposes of establishing conformity, void areas which are less than 5.0mm in depth will be deemed to be contact areas.